Question: My husband and I are heading west this summer to float the Madison. We’ve only fished out of a drift boat once before, and we kept tangling lines. How can I avoid that — and the ensuing glares from the old man — on this trip? Answer: When I used to row a drift boat on the Yellowstone, I witnessed many examples of the marital discord you describe. For some reason, husbands always assume that the wife is the problem. I wonder why that is? The most surefire way to avoid tangles during casting is abstinence: don’t cast at the same time. Since the front angler usually has his back to his companion, it makes sense for the rear angler to be in charge of holding his cast until the front angler’s line is on the water. This requires a certain amount of forbearance, especially when you’re focused on rising fish or particularly good trout lies. Problems arise when the front angler wants to recast quickly after laying down his line or is inconsistent in the timing of his casts. It makes more sense, then, to use casting angles to avoid tangles. If both anglers cast at similar angles to the centerline of the boat, their casting paths will not intersect, making tangles nigh impossible. 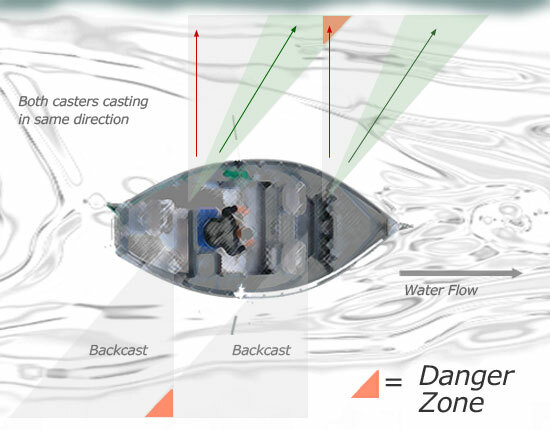 Again, however, this assumes that neither caster is going to alter the angle based on what’s happening on the water. (Something that invariably happens once in awhile.) In general, both anglers should cast between 60 and 45 degrees to the centerline. If the front angler casts too far downstream or the rear angler starts casting directly at the bank (or even upstream), disaster is imminent. Not coincidentally, correct casting angles also protect the guy rowing the boat. Another reason for the front angler to keep his casts downstream from the boat is to avoid cutting off the rear angler’s path to the bank. If the boat is moving faster than the current, the front angler must pick up his fly before it enters the rear angler’s lane. It can be very frustrating to sit in the back of a drift boat and have nowhere to cast because your partner’s line and fly are in the way. To help himself in this situation, the rear angler can open up more water and extend his drifts by making reach casts that end with his rod tip upstream of the boat. These are general rules that will work in most situations where the boat is in motion and parallel to the bank, but your best bet is to listen to your guide. He knows where you should cast, and he wants to avoid tangles, as well. Plus, he doesn’t want to be beaned by a split shot or impaled by a size 4 Sofa Pillow.